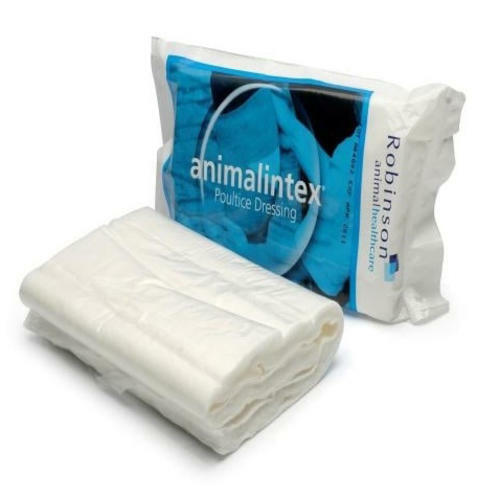 Robinsons Animalintex Poultice Dressing combines a proven active ingredient with a new 170gm needled cotton wool for extra strength and ease of use. Licensed for a broad range of equine injuries and conditions it is an effective healing aid that can be applied as a hot or cold wet poultice or dry wound dressing. Suitable for the treatment of infected wounds, open wounds, foot punctures, corns, bruised soles, thrush, seedy toe, abscesses, laminitis, sandcracks and thorns.